Not all businesses have the same network needs. Nevertheless, there are a handful of things just about any business will want. Reliability, speed, adaptability. Features you generally need on any router are needed in even greater measure when applied to business. Then there are things almost unique to business routers. Extra layers of security, more comprehensive control over monitoring network usage, automatic data backup features, and so forth. Features like these can sometimes make-or-break a router selection, especially if you’ve got special network needs. These days, a little room for future growth built-in has become a part of almost any business-facing network equipment. 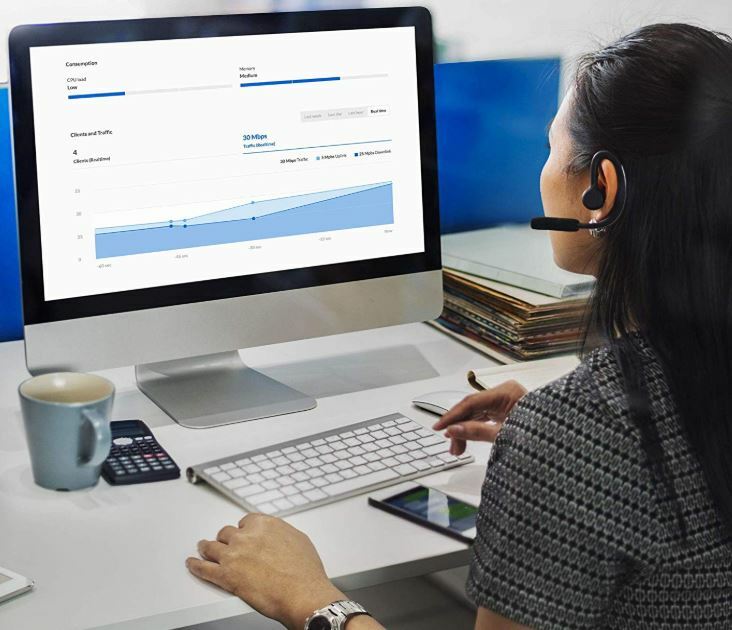 Most small businesses typically don’t need network capabilities which greatly exceed the capabilities of a decent entry-level business router. These factors combined, it’s actually not that tough for most people to select a reliable router for their business. Linksys has made business class equipment for about as long as the Internet has been around. And in that time, they’ve become one of the more reliable names within the networking niche. Recently releasing their new Dual Band-Cloud Wireless Access Point in both the AC1200 and AC1750 format, one thing is clear. Linksys has no intention in giving up an inch of their market share. Comparing one to the other, these two routers actually share far more in common than not. They’re installed and controlled in the same way. They have essentially all the same hardware and essential features. They really only differ when it comes to maximum internet speeds, as implied by their name. But the Linksys Business Dual-Band Cloud Wireless Access Point is more than merely a router. It’s full functionality actually comes closer to something like a network hub, bringing you control over the network from one central place. Intended to be mounted in the wall, the Linksys Business Dual-Band Cloud Wireless Access Point measures 9.2 x 9.6 x 1.8-inches. It’s got a hexagonal shape, loosely resembling a smoke detector. The mounting process is quite simple for any number of reasons, the most important being the entire body weighs only one pound. One thing you’ll find is missing from the Linksys Business Cloud Wireless Access Point is the typical array of LEDs you may find on the front of a router. Generally built with anywhere between six and eighteen LEDs, intended to give you all kinds of detailed information about what’s going in inside the network, such lights are almost entirely absent from this wireless access point. 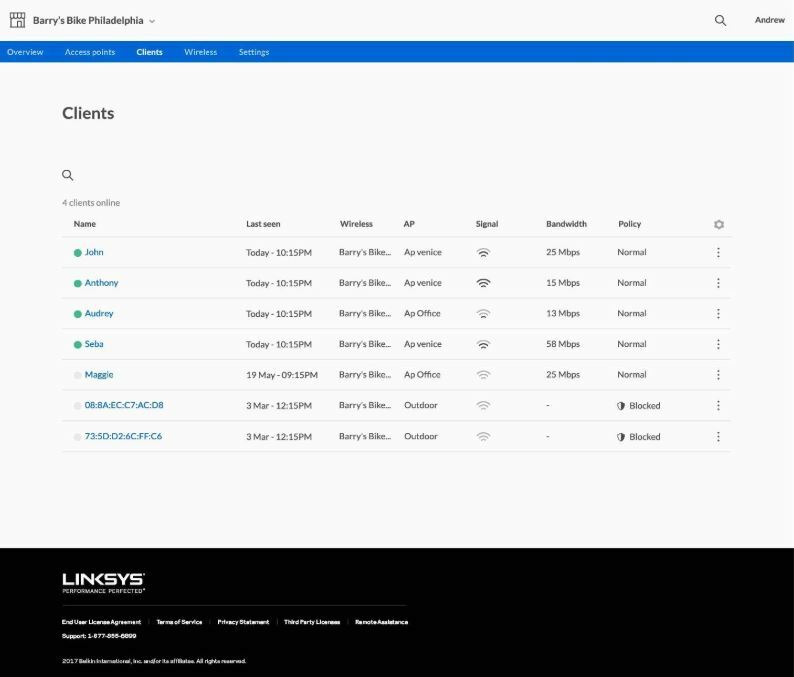 Linksys has moved all that diagnostic information to the software side, giving you all the same information in a more presentable digital format through their control app. This difference also gives you a more direct access to tech support and resolution, should it become necessary. 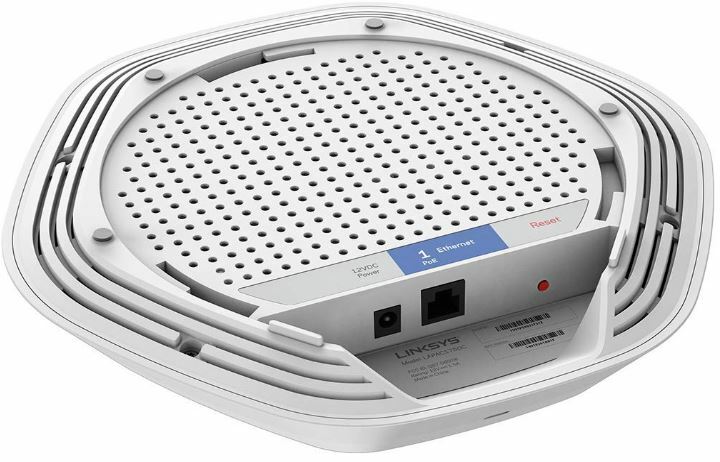 As a result, the topside of the Linksys Business AC Dual-Band Access Point features only one solitary LED. Turning to the bottom of the Linksys Business Dual-Band Cloud Wireless Access Point, the only prominent port is the Ethernet jack. Tucked away out of sight, there’s an optional 12v DC power port, and four small anti-slip pads. In addition to two tiny feet positioned towards the backside of its base, there’s a little extra space carved out for the cables intended to slip out the backside of the router. That helps the device sit flush against the wall. It makes for a professional-looking installation you can fit almost anywhere. One more thing that helps make everything a bit easier to setup. The Linksys Business Dual-Band Cloud Wireless Access Point is fully PoE+ compatible. That compatibility is really at the heart of what makes it so easy to mount this device — you don’t have to worry about running a separate power cable. PoE+ draws 25.5 watts, and carries additional support for camera features like panning, tilting, zooming, as well as alarm systems. Even if you’re not currently using equipment where you can take advantage of PoE+, the inclusion of a future-proofed standard is a nice addition. You never know what kind of device will find its way on your network over the course of a few years, and POE+ helps make this equipment a bit more adaptable. Managing a network can be difficult by design, especially if you want to make minor technical changes. But if your business is like most others, the health of your business and the health of your network are fairly intertwined. You need to be able to do some basic things to protect your network, and if you’ve got to set them up yourself, it would be nice if you didn’t need to get a degree in the learning process. Linksys helps make things a bit simpler with browser-based management of the network, which can be used remotely. 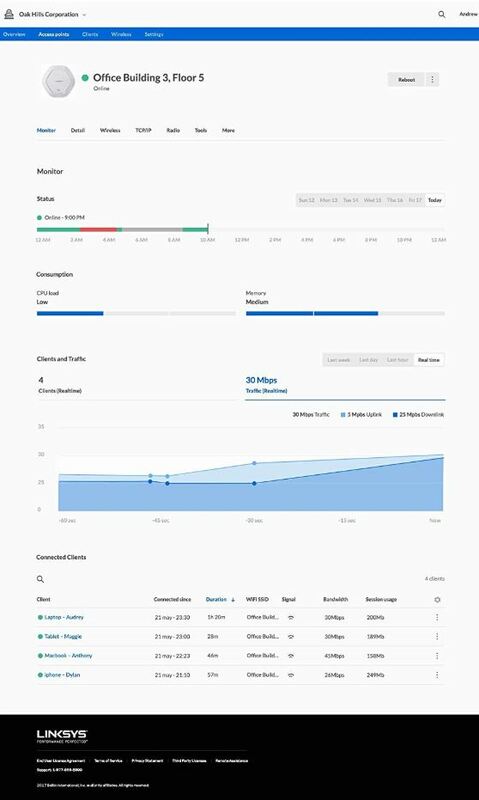 Centralized controls, constructed against an easy to use dashboard, makes adapting this network a fairly approachable process. If you’re familiar with the nomenclature, then you already know the big difference between the AC1200 and the AC1750 version. Otherwise, it’s quite easy to work out. The AC1750 reaches up to 1.75 Gbps bandwidth. The AC1200 reaches up to 1.17 Gbps. They both use dual-band wireless connections, but the AC1750 pulls far more weight against the 5Ghz band. It’s not that common to run a gigabit connection, especially for a smaller business. Most businesses will find you really need more than a dozen people trying to use the net before bandwidth becomes a concern at all. But for businesses which do need to exceed a Gigabit connection, the AC1750 works out to roughly 60% higher bandwidth capacity. Beyond that, they’re nearly identical. They both use the same guts to help process network processes efficiently. Both keep safety standards high. High bandwidth activities like video conferencing, cloud storage backup, can go on without a hitch and without interrupting the network. The capabilities of this equipment are best exemplified by its Cloud Manager service. 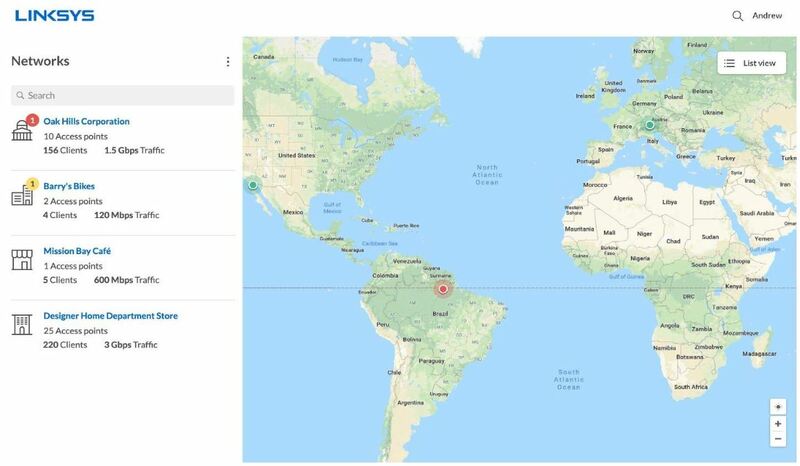 The general idea of the service is helping people manage their network from several access points, giving you a real-time statistical look at the network activity, and the health of the network. If the Cloud portion of the name didn’t give it away, that control is extended over remote access. When you’re managing multiple wireless access points or you’re keeping tabs on a larger network, things can be pretty chaotic. The Cloud Manager is about making the chaos manageable through one place, with the general goal of simplification poised to reduce costs. 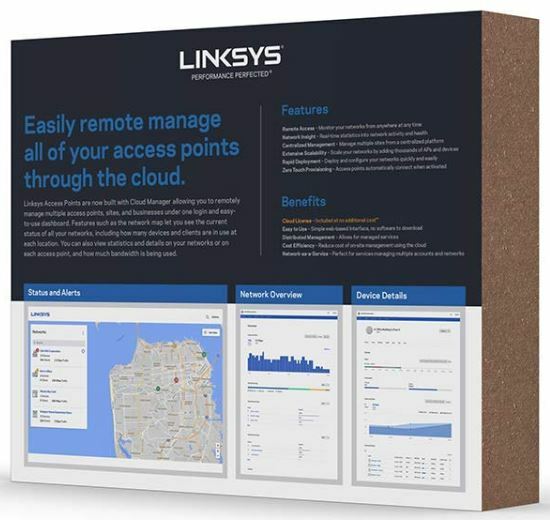 Putting collected data into action, the Linksys Business Dual-Band Cloud Wireless Access Point can also help you establish alerts for real-time statistics, or help network administrators address a possible network issues before they become a problem. Most routers have their reset button recessed inside the chassis, so you need a pin or needle to reach them. The Linksys Business AC1200 has a bright red reset button that is accessible at one touch. That’s Preferable for someone who has to reset their network on occasion, but not preferable for someone who has their equipment in a public place. Although wall mounting is not technically required, it would be a small shame to not mount equipment that’s been made so easy to mount. And while a secure mount is always preferable to something quick and simple, a few sticky-pads would just about be enough to hold-up this equipment. Linksys has formidable, well-respected security service. All the standard things you’d expect of equipment like this are present. Wi-Fi protected access WPA and WPA2 security protocols are supported. The Wi-Fi access can be locked behind a captive portal, giving a user an authentication age before they’re allowed to use the net. And like almost any modern cloud-based security service, you get almost instantaneous updates to help protect your network from the latest threats. However, the Linksys Business Dual-Band Cloud Wireless Access Point does not offer extra layers of security. You don’t see native VPN support at all. Along with the Wireless Access Point, both the AC1200 and AC1750 include five years of support through the Cloud Manger service. By contrast, warranty support for Linksys is all over the place. Literally. You’ll find warranties are two years in some countries, three years in others, and unavailable in others still. Within the United States, it’s a non-transferable, 2-year warranty. Who Should Choose Linksys Business AC1200 & AC1750 Wireless Access Point? The AC1200 is a good choice for most businesses. Serving as an access point to a wider network, it’s scalable for the future, simple to setup, and adaptable to a wide range of purposes. Simplicity extends between both the software and hardware side of setup, with the latter being as easy as plugging in the Ethernet cord. Exceeding a gigabyte of bandwidth is something most businesses will not have to do. But some businesses will take advantage of the upper end of scalability from these devices. If you’re anywhere near using 1Gbps of data then you’ll want to consider getting the AC1750, giving yourself some room for growth. Simplicity is really what makes this kind of equipment so admirable. Simple design is pretty important for business router, especially if you have to rely on people without expertise to occasionally resolve problems with the Wi-Fi. Once you know how much bandwidth your business needs, either of the Linksys Business Dual-Band Cloud Wireless Access Point could be an excellent choice.